What’s There to Do in Michigan? Plenty! You are here: Travel Blog » North America » United States » What’s There to Do in Michigan? Plenty! If you’ve never thought about visiting Michigan before then you’re missing out! Michigan boasts some world-class attractions that will keep even the most demanding tourists happy for weeks. Want to find out more about the delights of Michigan? Then here are some of the highlights of the Wolverine State to check out during your vacation. The Detroit Institute of Arts (DIA), which contains one of the most important art collections in the USA with over 100 galleries and more than 65,000 works of art. The Detroit Zoo, in the north of the city, which contains nearly 300 species of animals. The Henry Ford, which is a museum in Dearborn in the metropolitan area of Detroit. You’ll have to travel a bit further to reach it, but it’s well worth the journey. The impressive collection was started by Henry Ford and contains a wealth of fascinating historical exhibits such as the presidential limousine of John F. Kennedy and Thomas Edison’s laboratory. Michigan is known as the Great Lakes State (it has nearly 65,000 lakes) and water sports are high on the agenda for many tourists. However, what you may not know is that Michigan is also a fantastic destination for wreck diving. Many ships have sunk in Michigan’s lakes over the years, and divers can enjoy these spectacular wrecks in the Michigan Underwater Preserves. They have a combined size of nearly 2,500 square miles, and include De Tour Passage, Manitou Passage, Sanilac Shores, Keweenau, and eight other preserves. The Great Lakes Circle Tour is the stand-out road trip in Michigan. 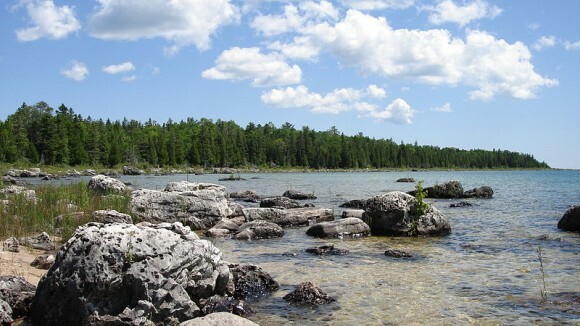 It connects all the great lakes, and there are a range of tours to choose from. These include the Lake Superior Circle Tour, the Lake Huron Circle Tour, the Lake Michigan Circle Tour, the Lake Erie Circle Tour, and the Lake Ontario and Seaway Trail, so choose the one that suits you and hit the road. Dinosaur Gardens in Ossineke is one of the top attractions for families in Michigan. In this 40-acre site you will find huge dinosaur replicas located throughout the park, some of which you can climb. As well as that, you can enjoy the views of Devil River, food bars, and more so you can easily spend a whole day here. Michigan is not without its fair share of excellent dining options, and you will find top restaurants located throughout the state. Some of the most popular places include Lafayette Coney Island on Lafayette Street in Detroit for a ‘coney’ and a beer, the West End Grill in Ann Arbor for some sumptuous appetizers and excellent grilled meat and fish dishes, and The Brass Cafe and Saloon in Mount Pleasant for friendly service and an extensive menu to suit all tastes. If you find that you’re spending too much time in Detroit and the other cities and you want to explore the wild countryside that Michigan is famous for, there are a number of fantastic places to visit. These include Isle Royale National Park in Lake Superior, boasting populations of wolves and moose, and Sleeping Bear Dunes National Lakeshore on the eastern coastline of Michigan, where stunning beaches, dunes, and forests combine to provide a spectacular feast for the eyes. From downtown attractions to natural wonders, Michigan really does have it all. So take some inspiration from the above list and discover the Wolverine State for yourself next time you want to plan an exciting vacation. Chris McMahon is a frequent traveler who enjoys blogging about his trips upon his return. His articles appear on a variety of US travel blogs. Click the link for hotels in Michigan.